I moved to Tajikistan, a small country north of Afghanistan, with my husband who had landed a job in international development in January 2015. Before I flew out, I made contact with a small London based charity called Healthprom who run projects in former Soviet Union states. The Tajik Healthprom team happened to be in London when I got in touch and so I was able to attend a networking event and meet them. This meant that when I got to Tajikistan, I was able to start volunteering at a local rehabilitation centre pretty much immediately. Since then, I have run a small paediatric community clinic jointly with a Russian / EU trained Tajik doctor on a part time basis. Luckily, my Tajik colleague speaks good English, so is able to translate for me. Through my volunteer work, I have been able to build positive working relationships with local healthcare staff over time. As I got to know the expat community and started to network at formal social events through my husband’s work, I was also offered a few one off consultancies with international NGOs which meant that I gained experience of the local state orphanages and schools too. This was very useful as the health system here is weak and fragmented and information about it is neither centralized or transparent. The World Health Organisation (WHO) also published a report on the state of rehabilitation in Tajikistan in 2015 which was very helpful. By early 2016, I had gained a lot of insight into the local culture and politics here and had identified 2-3 possible speech therapy projects. I approached the British Embassy here in Tajikistan’s capital, Dushanbe, later in the year and was lucky enough to obtain funding for two of them. The first project started in January 2017 (the second will start in August 2017). Both projects are designed to deliver training and then follow up on a monthly basis to try and ensure participants put the training action over time. This is a strength as well as a weakness as we had no idea if participants would attend the follow up sessions. The long term aim is to ‘train the trainer’ and so provide a degree of sustainability for the future. The premise for the first project was my observation that local professionals consistently did not know what to do when faced with non verbal children with severe autism and /or learning disability. So this first project is designed to train a range of healthcare professionals in how to start supporting an individual with these kinds of difficulties. 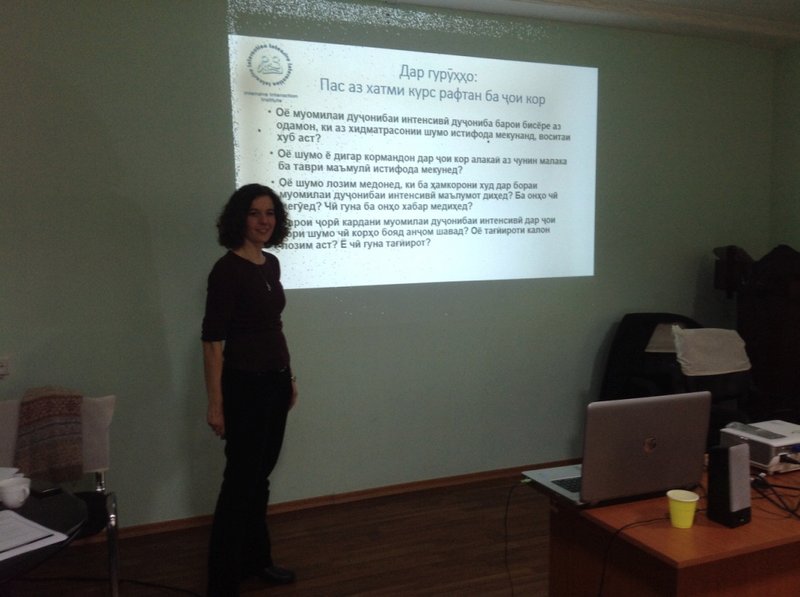 In January 2017, Amandine Mourière, Associate Trainer at the Institute of Intensive Interaction, came out to Tajikistan and delivered two introductory courses to a total of 48 participants. As the training was free for participants, the criteria for taking part was that participants be directly working with children/adults with severe autism/learning disability. 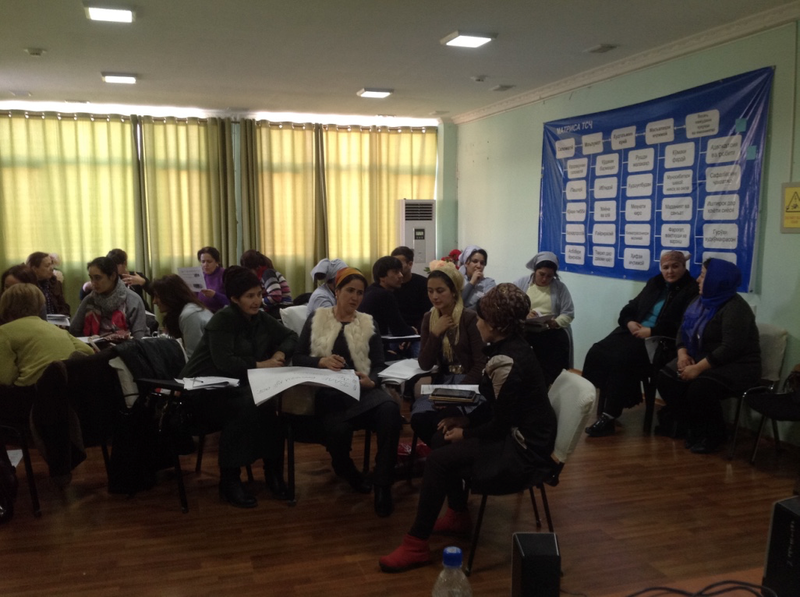 My Tajik colleague’s local contacts was key to ensuring appropriate participants were invited to attend from a wide range of community based groups (including parents, doctors and staff from state orphanages, representatives from disability support groups and teachers). Neither of my projects would be feasible without the support of local healthcare professionals. Intensive Interaction’s naturalistic approach is revolutionary for healthcare professionals here as it is the opposite end of the spectrum from the very directive, Soviet approach to interacting with children with disabilities. In this sense, it was and continues to be a definite cultural challenge for the course participants. However, the training courses clearly demonstrated progress of a variety of children and adults through the use of video clips. Participants have consistently rated the use of these video clips very highly in written feedback both during and after the training courses. For participants to share experiences of using intensive interaction approaches in their work in a supportive environment. To use the group time as a joint opportunity for group problem solving, discussion and learning. To create an opportunity to remind participants of the main learning points / themes from the training. To develop a culture of individual reflective practice. To support participants in developing confidence in their use of Intensive Interaction’s techniques. To promote a culture of positive support between participants as opposed to mutual criticism (which is a cultural tendency here). To ensure consent is obtained and that personal information is protected. To identify 2-3 participants that demonstrate sustained interest over time with a view to training them up as Intensive Interaction trainers in the long term. Currently, more than 50% of the original participants are attending the feedback sessions on a regular basis. There are barriers to participants attending the feedback sessions such as not being paid, having to travel (and pay to travel) long distances, not being able to take time off from work. These are significant issues when employment in state institutions is very poorly paid. We also follow up with two participants from Khujand, a northern city of Tajikistan on a monthly basis via Skype and have offered a chance for all participants to phone in once a month too (though this has not been taken up). Every two months, we administer feedback questionnaires to monitor specific outcomes. I am also in touch regular touch with Amandine Mourière at the Institute of Intensive Interaction. The key to this first project’s success, however, is that participants are seeing direct results when they use an Intensive Interaction approach in their work. Also, the approach simply requires knowledge and application of the techniques, so no ongoing resources are required. The only expense is a video camera which is something most participants have already had access to through their employer or been able to borrow. The follow up sessions will continue until January 2018 when the project finishes. I will report on my second project once the training is delivered in August 2017!